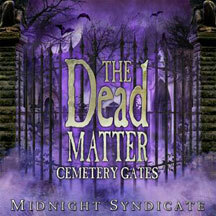 Written in the style of Midnight Syndicate’s other CDs, the disc draws listeners into the supernaturally-charged world of The Dead Matter movie . . . taking them on a musical journey into a realm of forbidden relics, druids, vampires, and the living dead. The disc also featured music from the score to the upcoming film. Beyond the cemetery gates the dead do not rest easily. An ancient Egyptian relic, vampires, and the living dead lurk amongst its shadowy crypts. Haunting symphonies and dark soundscapes call you into the world of the undead.